The PrezPix study showed that Pinterest can be a powerful research tool, especially in the aggregation, curation and evaluation of photos from multiple venues. Researchers from this study found Pinterest’s interface to be simple, yet effective. Researchers appreciated the ease of clicking to pin, and the ability to highlight captions (or other text) and have that text automatically appear as a caption on the Pinterest pin. Researchers also found the tiles of the pins on individual boards, and the boards on the home PrezPix Pinterest page to be both aesthetically appealing and easy to evaluate at a glance. The “real” coding was conducted photo by photo, but a simple scan of a board allows casual viewers to get a sense of the tone of coverage of an outlet, as well, of course, of the absolute number of images found in that news outlet. The signal advantage of using Pinterest is transparency. Pinned photographs link back to their original locations and audience members can evaluate the “raw” images for themselves. In an era of open data, when increasingly researchers and journalists need information to be online, searchable and mashable, Pinterest is a significant asset. “Pins” on Pinterest’s boards do not stay ordered chronologically: The inability to rearrange pins on Pinterest boards — including ways to hard order, number or collate the images, limits how the boards can be used to present information to others. Not everyone want serendipity in their Pinterest tiles. 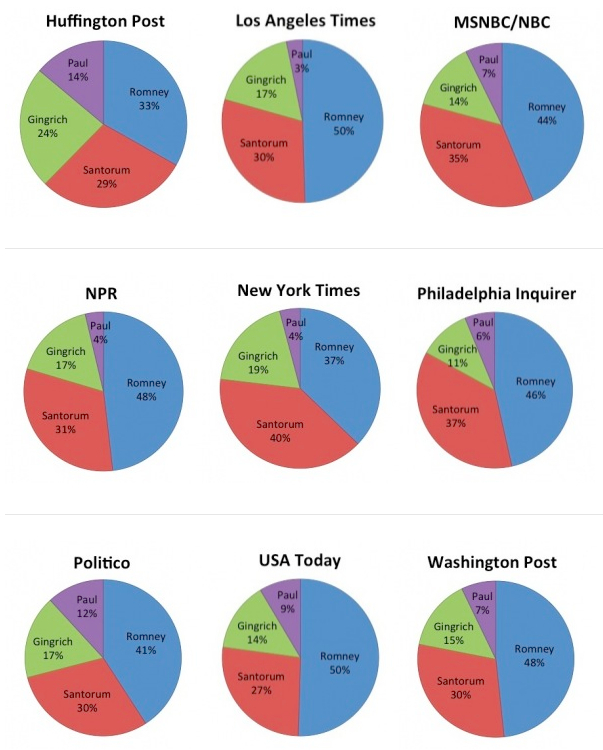 It is not possible to “pin” slideshow photos or video on many news outlets: This was the greatest limiting factor in researchers being able to pin and then evaluate the same number and kind of “still” images that viewers saw when they visited the 21 news outlets over the months of the 2012 presidential election campaign. 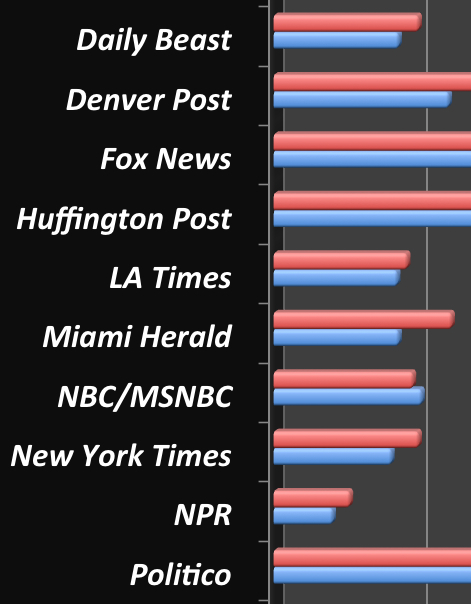 This also was a limiting factor in making comparisons across news outlets. The Washington Post, for example, which used slideshows extensively, did allow photos within its slideshows to be pinned to Pinterest. The New York Times did not. Many news outlets use slideshow tools to host daily or weekly photos of events, and they are typically heavily featured in the sidebars of multiple articles. An inability to be able to gather and assess them limits how researchers can assess what photos visitors see on those sites. 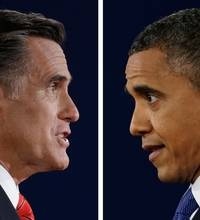 As a result, researchers evaluated many more photos from the Post than the Times — and it is to be expected, therefore, that some of their assessments of the Times would not be accurate as those of the Post, since a smaller proportions of photos were evaluated. There is no way to determine if the photos researchers gathered across a news site were representative of the (same kind of) images posted in daily or weekly slideshows. Those outlets that do not make all their visuals available to pin via Pinterest may not care if researchers cannot easily grab their images. But those news outlets may be interested in having their visual summaries of the news to have a second, and possibly viral life on Pinterest. If so, those sites should adjust their protocols so that photos in slideshows are findable and pinnable by Pinterest’s Pin It tool. News sites change URLs of stories, orphaning Pinterest’s photos: Researchers found troubling that some sites, such the Atlanta Journal Constitution, regularly reassign a URL to stories or to a revolving scroll of updates, put articles behind a paywall after a delay or even delete their stories (and therefore their photos). As a result, Pinterest pins to those images either “die” and therefore the photo archive on Pinterest is lost or most often the hyperlink to the originating photo is lost, and with it the viewers’ ability to click back and see the image in situ. 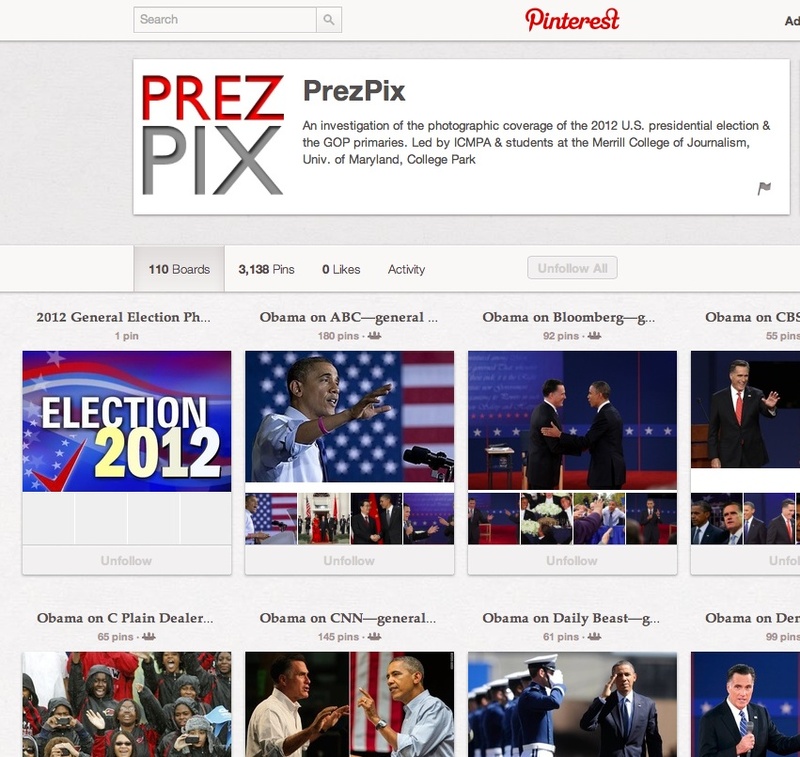 For more details on the methodology of the study and the use of Pinterest, also see the About PrezPix page.